Picture if you will a husky 17 year-old guy, crying in the middle of a Best Buy parking lot in Merrillville, IN. I’m talking crocodile tears and snot bubbles. 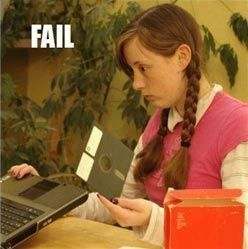 That kid was me in 2003, about 5 minutes after finding out that the Geek Squad wiped my laptop hard drive during a cosmetic repair. All of my music, term papers, photos, etc… gone like the wind. 12 years and 5 computers later, I’ve learned a thing or two about regularly backing up my files. Hard drives have gotten much more reliable over the years, but you never know if and when things will go haywire and your files are in jeopardy. Thankfully I’m a regular user of Apple’s Time Machine feature (which takes a screenshot of your entire hard drive), so I wasn’t too worried. After letting it rest for a few days and trying again, it wouldn’t even boot up. I took it to UBreakIFix a few days after I got back and the gentleman that ran the diagnostics test said that it needs a new motherboard. It could crash. It can happen at any time for any given reason. No one is immune to it, but you can be prepared if it happens. It could get a virus. It could come from a site you had no business being on, a compromised email sent by a friend, or even from that torrent site you get your movies from. No judgement. It could get stolen. This happens more to people carrying their laptops around, but there’s always a small possibility that a crackhead will break into your house and swipe your computer tower for their next fix. Water damage. Liquids and electronics don’t mix, and rice doesn’t quite work on computers. Fire damage. It’s an electronic. It could happen. There are many different methods of backing up your files, but the most common are External Hard Drives and Cloud-Based Storage. This is the best method for backing up your files in my opinion, as it is simple and inexpensive. You can manually save your files on the EHD or use a backup software such as Apple’s Time Machine. Services like Dropbox, Google Drive and Box.net provide cloud-based storage, which keeps your files on a web-based drive accessible anywhere you have an Internet connection. This is great for those who are constantly on the go, but not-so-good for those with no web access. These are good for smaller, more frequent file backups and are good if you need to work on files from several different computers. This is becoming less and less common, but this is a tried-and-true method of archiving files of all kinds. There are other ways, but there’s no telling how long they’ll last before they become obsolete.